Uke straps are very similar to guitar straps. They’re used to support your ukulele so that you can play it from an upright position. They're usually made of cotton and leather, or a combination of both of these materials. The best ukulele straps are usually those that are comfortable, durable, and easy to put on. Now, in our review, we will provide a brief description of the top 10 best ukulele straps we've found, along with their affiliation to the corresponding price point category. 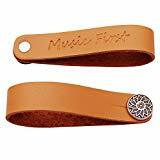 Music First’s county style ukulele strap features a cotton outer side and the leather & cotton inner side. It’s 1.5” wide, and 48” long and is adjustable to down to 27.5". 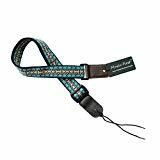 The strap is attractively designed with a color pattern that appeals to a lot of people. If this pattern doesn't appeal to you, Music First offers a number of other straps (in our list below). In addition, are large number of selections are available here. The strap attaches by tying one end to the neck and placing the other end over the strap button on the body of the ukulele . 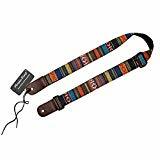 This set of ukulele straps are 1" wide and can be adjusted from 22" up to 32" in length. 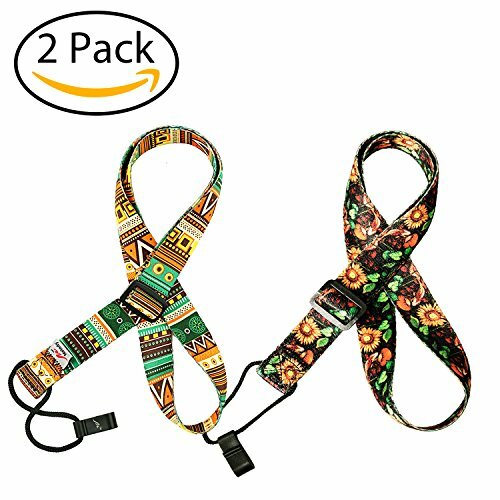 Made from a durable polyester, each strap features either a floral or geometric pattern. The clip on the end of the strap fits into the sound hole. The strap goes under and behind the ukulele and slips over the neck. It’s ideal for those ukulele models that don’t have a strap button. 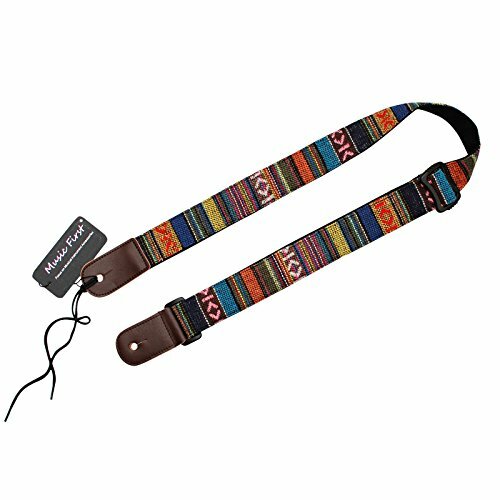 Consider these straps if you are looking for an inexpensive but colorful option for your ukulele. 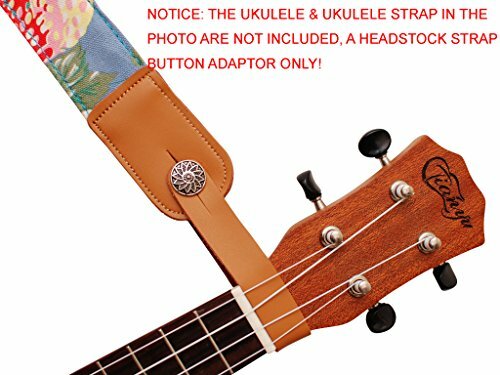 This clip-on uke strap features a peculiar design – it’s not like regular straps. This strap can be used in two ways. First, place it around your neck and place the clip in the sound hole. The second option is to place the open end over the shoulder and clip the strap around the the head of your ukulele (see the image). Adjusts from 34" to 51 1/2" in length. It’s ideal for those ukulele models that don’t have a strap button. The strap comes with a set of 2 complementary picks. 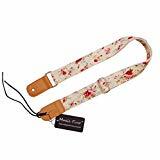 This strap is made from a cotton/linen fabric with leather ends. Designed to attach to a ukulele with a strap button, a button and screw are included for those wanting to install a strap button if needed. The strap adjusts from approximately 30 1/2" up to 52" in length. 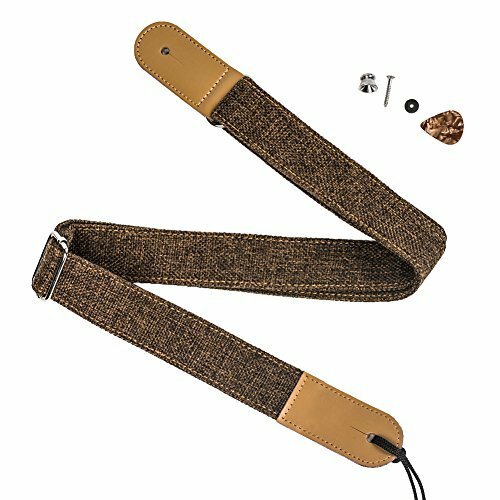 An inexpensive option for someone wanting a basic strap for their instrument. 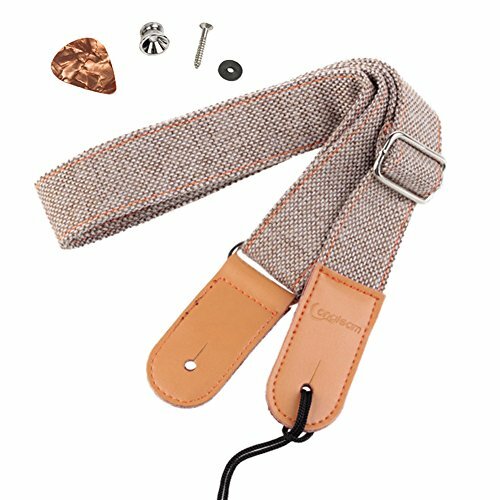 Music First offers this colorful option for the buyer wanting a strap with the typical button and tie attachment. For instruments without a strap button, a button is provided. 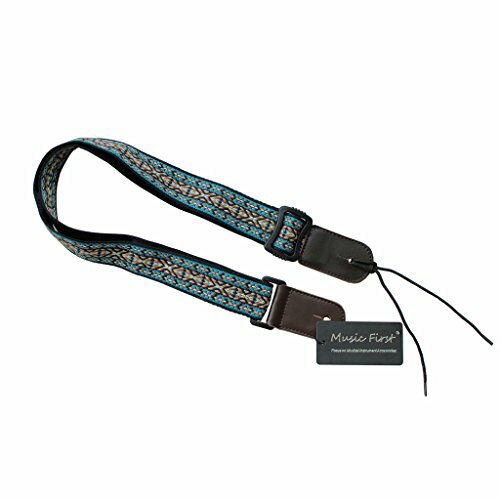 The strap is made with from a blue cotton pattern with leather ends. It adjusts from 48" down to 27 1/2" and is 1 1/2" wide. 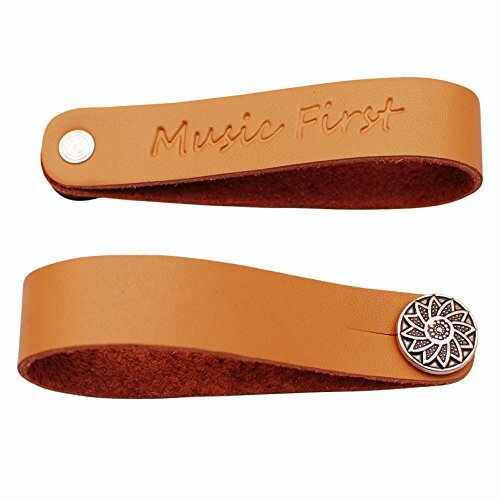 As mentioned above in our review, Music First has a wide selection of straps available here. CloudMusic has produced a blue beautiful strap that is 1.5" wide and can be adjusted from 29 1/2" up to 52" in length. 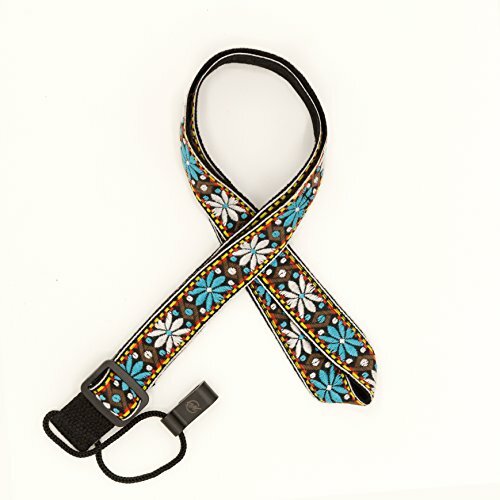 The strap comes in several other pattern choices (floral, modera and pink). 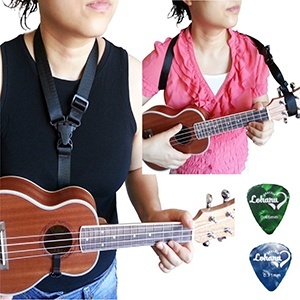 It is designed for the ukulele with a strap button and ties to the neck. A strap button is included for those wanting to install it. This colorful strap will add a bit of fun and pleasure as your ukulele. Like to see more straps from CloudMusic? Check these out. CloudMusic also offers this strap design with a J hook which clips to the sound hole and the strap passes under the ukulele and is placed around the neck. The strap adjusts down to a length of about 25" and is 1" wide. It’s ideal for those ukulele models that don’t have a strap button. Shown in a beautiful blue and white flower pattern, this style strap is available from CloudMusic in a many other patterns. 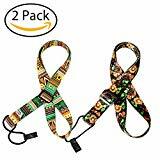 Visit this Amazon listing (Click for Prices) to see the wide selection of patterns and fabric options including the "scarf" style. 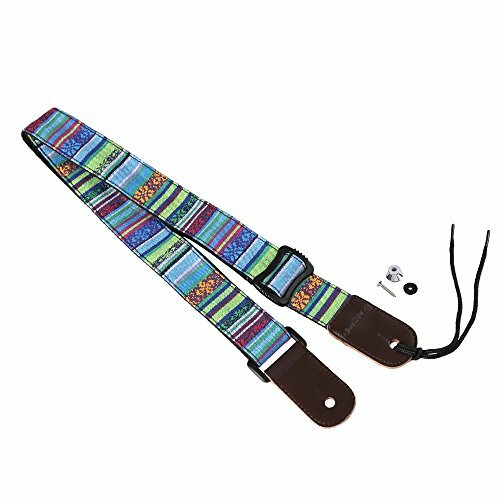 This strap is approximately 1 1/2" in width and adjusts from 29 1/2" up to 49" in length. It is made of cotton and nylon with leather ends and has a metal buckle for adjusting the length. It attaches to the strap button on a ukulele and ties to the head/neck area. A strap button is included in case your ukulele does not have one. Note that drilling is required to attach a strap button if your ukulele does not have one already. Pictured here is the light brown pattern. It is available in a number of other patterns including cyan, daisy, dark brown, light beige and black. This strap is made from cotton and leather and features a delicate floral pattern against a cream background. It is 1 1/2" wide and adjusts from 48" down to 27 1/2" in length. It comes with a strap button that can be attached if necessary. It attaches in the typical fashion: to the strap button on the end with a tie to the neck/head. Note that the strap button "lock" pictured in the listing is not included with this strap. Interested in using a strap button lock to secure your ukulele strap? The lock replaces the string that ties to the neck/head. You can find an assortment of strap button locks here. 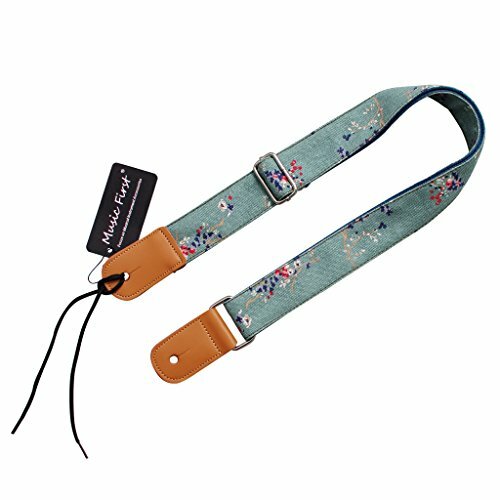 This strap is made from cotton and leather and features a plum flower pattern against a light blue background. It is 1 1/2" wide and adjusts from 48" down to 27 1/2" in length. It comes with a strap button that can be attached if necessary. You can find an assortment of strap button locks in various colors and button styles here. Interested in using a strap button lock to secure your ukulele strap? The lock replaces the string that ties to the neck/head. The picture shows the front and back of the strap button lock. To attach it to your ukulele, remove the string tie from your strap. Then feed the strap button lock under the ukulele strings at the head of your instrument. Attach to the strap button lock to either end of your strap. Attach the other end of the strap to the strap button on the end of the ukulele. Note that the picture refers to the strap button lock as a "headstock strap button adaptor". Make sure that the strap you select will attach to your ukulele (either button/tie or sound hole hook). Keep in mind what material was used in the manufacturing process, the price, and the length of the strap before you choose the one for you. We hope that this list of top 10 straps helps you find a strap that you'll be very happy with.